I enjoyed the Novice days operating code. Mr Snellgrove loaned me some type of transmitter that had plug-in coils to change bands and of course crystals to change frequencies. I got a Drake 2-C receiver as a present and had a Hy-Gain 18-AVQ as the main antenna. The solar cycle was good back then because I had a lot of fun working 15 meters. Then with some study on theory and code I went up to FCC building in Atlanta to take the General test. I passed and became WB4JFW. I got a Drake T-4XB from my dad as a reward. So I used the T-4XB with the Drake 2-C receiver. Well I met some great teen friends on the air Lionel, Forrest and Curtis. We spent many hours chatting on 10 meters and visiting the adult hams in Dothan. There was a club in town and we were the main operators for the local Field Day. When I was looking toward college my ham experience made a perfect transition for majoring in Electrical Engineering at Georgia Tech. I was able to entice my buddy Lionel in attending Georgia Tech as well. The degree has certainly been worthwhile. I did some operating and attending Hamfests while at college but of course there was a lot to do. I moved to Manchester Tennessee for my first job and seven year later moved to Panama City Florida, At that point I dropped out of the the hobby. My wife and I were busy with our three girls. We also bought a house near some high voltage lines and I thought I could not do ham radio and let my license lapse. Well in 2008 I thought ham radio might fit in with my other hobby, model and high power rocketry. I was helped getting back into the hobby by the hams at the Panama City Amateur Radio Club. I restarted with the technician followed by General and Extra. I settled into my current call N4KGL. I used a loaner HF rig for a while and then got an IC-703. This launched me into the QRP world and I got back into my favorite mode CW. Well I did not think I could do it but I built two nice QRP (low power) rigs. 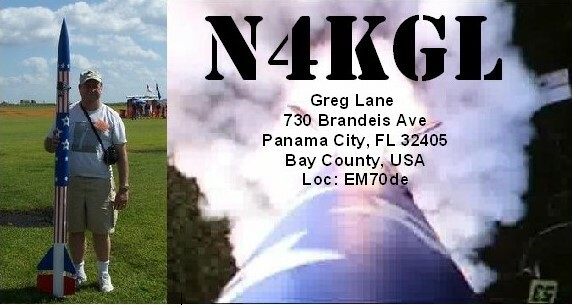 I have also joined the various code and QRP groups Like SKCC, FISTS, Flying Pigs and so forth. I have specialized in QRP portable operations and setup when I am on trips for work and family visits. I even operated from Vicenza Italy for several weeks. Casual CW is still my favorite mode and fits in with the QRP. I have met a lot of Ham friends locally and met a old buddy John K4KQZ by chance on the air. I worked with him 30 years ago in Tennessee. He was not a ham back then. I also looked up my teen Ham buddies from Dothan and they are doing well.